Settle down, grab a drink and prepare for the longest episode of Crossing Zebras yet, clocking in at a rather meaty three hours. But it’s a good three hours with Jeg and Xander getting the opportunity to chat to not one but TWO CSM7 Chairs in the form of Seleene and The Mittani, both making their maiden appearances on the podcast. We’ve been excited to get both these guys on the show for some time so it’s the cherry on the cake that joining them is CSM7 member and Declarations of War host Alekseyev Karrde. The conversation twists and turns through what happened with CSM7, Fanfest and the composition of CSM8 while Mittens also talks about the phenomenal success of TMdc. We did have a fair few technical glitches in this one firstly with Xander telling Aleks the wrong record time then with Aleks constantly dropping out but we ironed it all out eventually. CSM7 – We spend some time dissecting what went right and what went wrong on CSM7 with Seleene (Aleks wasn’t around by this point). Part of this discussion includes some conversation on why Seleene was sometimes distracted from the Chairmanship position by real-life issues. The Mittani – Xander gets some one-on-one time with Mittens to discuss the success of TMdc and where it could go in the future, how Fanfest went for him in his new role as a member of the gaming press and how CSM7 did as well as how CSM8 might do. 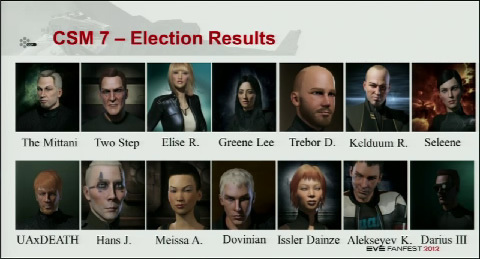 CSM7/CSM8/Fanfest – We spend some time discussing the Mittens interview with Seleene before being hotdropped by Greg. This gives us a chance to go over again some of the earlier questions but with a different CSM7 perspective. We also go over what it was like to hear all those things CSM7 had been working on announced at FF.